On Christmas Eve we used to finish dinner quickly so we could turn on the radio to track Santa with the help of the North American Aerospace Defense Command. We knew we had to get into bed before he got to California but we didn't mind at all knowing he was on his way. Soto's Santa. On his way to the sleigh. The tradition began in 1955 after a Colorado Springs-based Sears Roebuck & Co. advertisement misprinted the telephone number for children to call Santa. Instead of reaching Santa, the phone number put kids through to the CONAD Commander-in-Chief's operations "hotline." The Director of Operations at the time, Colonel Harry Shoup, had his staff check the radar for indications of Santa making his way south from the North Pole. Children who called were given updates on his location and a tradition was born. These days you can track Santa via NORAD on your browser. The site is full of extras to keep you busy until you hear sleigh bells. And Colonel Shoup's successor is free to fiddle with the hot chocolate machine on Christmas Eve now. 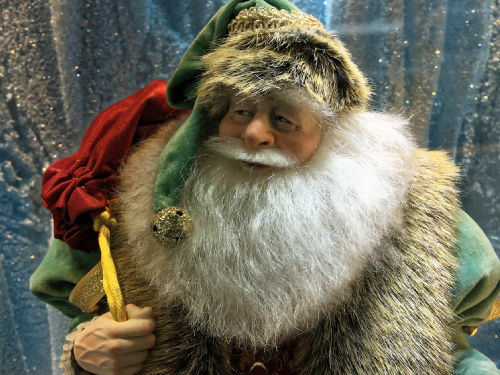 We found our Santa in downtown San Francisco last weekend. For a few years now the window displays by designer Jim Cardosa at Shreve & Co. have featured Kat Soto's art dolls. We never miss the imaginative scenes whose characters sparkle even more than the jewels they display. In a blog entry titled One of a kinda, Soto tells the story of how it all came about, starting with her grandfather's shop on the fifth floor of the Shreve building where he had designed opera necklaces for the store since 1932. Her father continued the family business until he passed away in 2011. I approached Jim with the concept of using my Art Dolls as mannequins for seasonal window display which I knew my Dad would delight in seeing each day when he finished his work and headed down to the street on his way home. Jim laughs when he recounts his first impression of my phone call offering dolls for display and admits, "Oh Jesus ... I thought you were going to foist some horrid apple-head dolls for my windows! Then I saw your portfolio and the possibilities of this adventure seemed really fun!" It's been eight years now and thousands have enjoyed the View-master like quality of the displays each Christmas and Easter. This year's window display is called A Clause for Celebration. All of Soto's window mannequins are for sale with partial proceeds going to benefit Hospice by The Bay. As one of Santa's appointed elves, we had to leave our real cameras at home to free our hands to carry all the special orders we had to pick up. So we resorted to an iPhone 6 Plus to capture the Santa you see above. A quick peek at the Exif data reveals it was shot at f2.2 and 1/255 second using ISO 32 at a 4.2mm focal length. We enhanced the shot using DxO OpticsPro 10, which includes an Optics module for the iPhone 6 Plus. There wasn't much wrong with the original capture, so "enhance" is really the right word for what we did in OpticsPro. We started by picking a custom white balance set to the beard color, which didn't shift the color noticeably. So the camera got that right. We enabled Strong Smart Lighting to enhance the contrast. And we cropped the portrait shot into a landscape for display here. There was a little glare from the window, so we enabled ClearView to knock that down a notch. That in itself is a good reason to use OpticsPro. When we were done, we had Santa right where we wanted him. And sent him on his way to you!